The concept of our new Mega 450 was to take our popular Mega 400 box and improve on it by adding some new ?racer requested? features. These new features are mostly related to making the box even easier to use than ever. These new features are, a custom LIGHTED KEYPAD, that is back lit for easy night use. Also, SCROLLING ARROW KEYS, and a "PRO MODE SCREEN", which is independent of the settings used in bracket racing. The Largest Lit Up Display Ever! is the ultimate in user friendliness! (everything is in plain english). 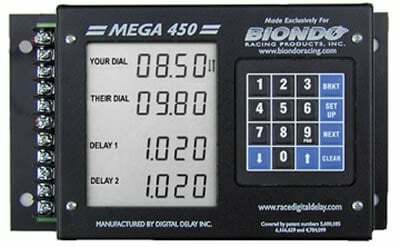 Total size: 8-11/16" x 5" x 1-3/4"Same dimensions and mounting as the Mega 400. (Except slightly deeper).